I am continuing my mini-series on US monetary history through the lens of my decomposition of supply inflation and demand inflation based on what I inspired by David Eagle have termed a Quasi-Real Price Index (QRPI). In this post I take a closer look at the 1970s. The economic history of the 1970s is mostly associated with two major oil price shocks – OPEC’s oil embargo of 1973 and the 1979-oil crisis in the wake of the Iranian revolution. The sharp rise in oil prices in the 1970s is often mentioned as the main culprit for the sharp increase in US inflation in that period. However, below I will demonstrate that rising oil prices actually played a relatively minor role in the increase in US inflation in that period. The graph below shows the decomposition of US inflation in 1970s. As I describe in my previous post demand inflation had already started to inch up in the second half of 1960s and was at the start of the 1970s already running at around 5%. After a drop in demand inflation around the relatively mild 1969-70 recession demand inflation once again started to pick up from 1971 and reached nearly 10% at the beginning of 1973. This was well before oil prices had picked up. In fact if anything supply inflation helped curb headline inflation in 1970-71. The reason for the drop in supply inflation might be partly explained by the Nixon administration’s use of price and wage controls to curb inflationary pressures. These draconian measures can hardly be said to have been successful and to the extent it helped curb inflation in the short-term it provided Federal Reserve chairman Arthur Burns with an excuse to allow the monetary driven demand inflation to continue to accelerate. It is well known that Burns – wrongly – was convinced that inflation primarily was a cost-push phenomenon and that he in the early 1970 clearly was reluctant to tighten monetary policy because he had the somewhat odd idea that if he tightened monetary policy it would signal that inflation was out control and that would undermine the wage controls. Robert Hetzel has a very useful discussion of this in his “The Monetary Policy of the Federal Reserve”. As a result of Burn’s mistaken reluctance to tighten monetary policy demand inflation kept inching up and when then the oil crisis hit in 1974 headline inflation was pushed above 10%. However, at that point almost half of the inflation still could be attributed to demand inflation and hence to overly loose monetary policies. Headline inflation initially peaked in 1974 and as oil prices stopped rising headline inflation gradually started to decline. 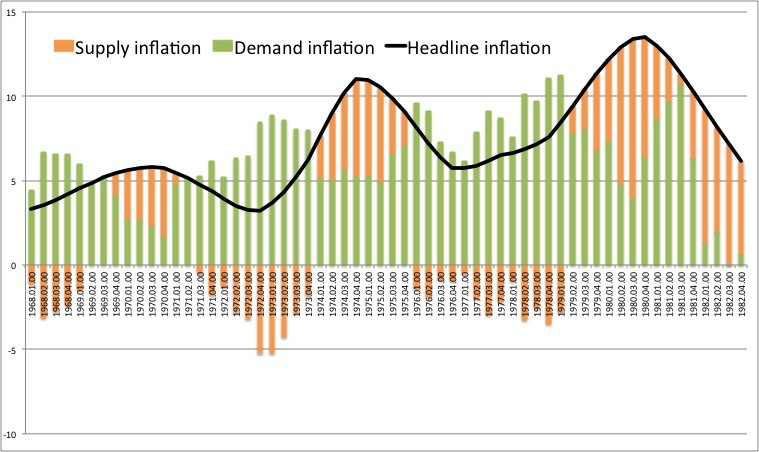 However, from 1976 demand inflation again started inching and that pushed up headline inflation once again. In 1979 Paul Volcker became Federal Reserve chairman and initiated the famous Volcker disinflation. Scott Sumner has argued that Volcker didn’t really tighten monetary policy before 1981. I agree with Scott that that is the conclusion that if you look at market data such as bond yields and the US stock market. Both peaked in 1981 rather than 1979 indicating that Volcker didn’t really initiate monetary tightening before Ronald Reagan became president in 1981. However, my measure for demand inflation tells a slightly different story. Hence, demand inflation actually peaked already in the first quarter of 1979 and dropped more than 5%-point over the next 12 month. However, as demand inflation started to decline the second oil crisis of the decade hit and that towards 1980 pushed headline US inflation up towards 13%. So there is no doubt that rising oil prices indeed did contribute to inflation in the US in the 1970s, however, my decomposition of the inflation data clearly shows that the primary reason for the high and increase through the decade was the Federal Reserve’s overly loose monetary policy. Finally it should be noted that the 1970s-data show some strength and weaknesses in my decomposition method. It is clearly a strength that the measure shows the impact of the oil price shocks, but it is also notable that these shocks takes 3-4 years to play out. So while oil prices spiked fast in for example 1974 and then settle at a higher level the supply shock to inflation seems to be more long lasting. This indicates some stickiness in prices that my decomposition method does not fully into account. As one of my commentators “Integral” has noted in an earlier comment it is a weakness with this decomposition method that it does not take into account the upward-sloping short-run AS curve, but rather it is assumed that all supply shocks shifts the vertical long-run AS curve left and right. I hope I will be able to address this issue in future posts. In my next post I will have a closer look at how Paul Volcker beat the “Great Inflation”.